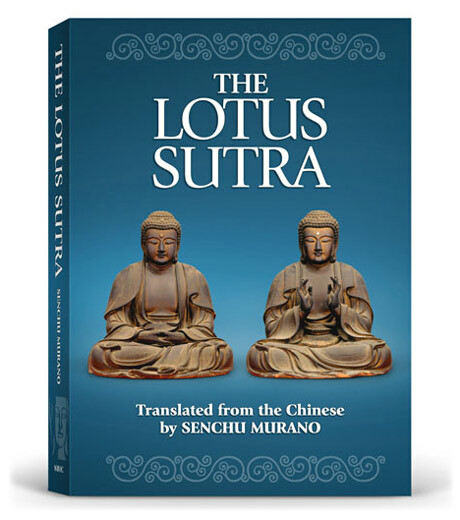 The Lotus Sutra is one of the most important sutras in Mahayana Buddhism and was likely written down between 100 B.C. and 200 A.D. Already well known in India, the sutra became more famous and influential when it was translated into Chinese by Kumarajiva in the year 406. After Chih-i founded the T’ien-T’ai School in China, based on the teaching expounded by this sutra in the sixth century, it was considered one of the canonical sutras of Chinese Buddhism. After the T’ien-T’ai School of China was introduced to Japan by Saicho and became the Tendai Sect, the Lotus Sutra became loved as literature among the people. The sutra is named the Lotus Sutra because the lotus symbolized the oneness of cause and effect, specifically the cause of aspiring to enlightenment (Buddhahood) and the effect of attaining it, since the lotus is a flower that blooms and seeds at the same time. It also symbolizes the purity of Buddhahood, blooming in the midst of our ordinary lives just as the lotus blossoms in muddy pond water. The Wonderful Dharma of the Lotus Sutra is that all living beings, whether they realize it or not, have the capacity to become enlightened. Everyone, without exception, can unlock the perfect wisdom and great compassion that reside in the depths of life. The Lotus Sutra also teaches that the life of a Buddha transcends our ordinary way of thinking and is beyond birth and death. Shakyamuni Buddha himself is in actuality the Eternal Buddha who is always present in our lives, leading us to the realization of our own innate Buddhahood.